Ok so not quite a sweet shop as such, but the chance to get your hands on some free goodies just by Tweeting. 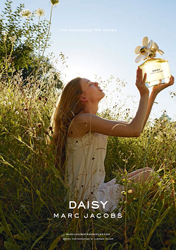 Marc Jacobs Fragrances is launching a pop up tweet shop to celebrate the Daisy range. The Daisy Marc Jacobs Tweet shop will be popping up in London’s Covent Garden from 15-17 August. I can’t wait to check it out and trade my tweets for goodies. No money will change hands, ‘payment’ will be in the form of tweets using the hashtag #MJDaisyChain. The more creative you are, the better the rewards. There’s going to be some fantastic things in the shop including a lounge, drinks, a live Daisy photo booth, nail bar and even a Vine booth. Everyone who tweets using the hashtag will receive a Daisy fragrance sample but the more creative you are with your pictures the better the chance you have of winning a snazzy new handbag. The three-day event will be open from 10am – 8pm on Friday and Saturday, and 10am -6pm on Sunday.